Please Note: All photographs on this page have been lifted from a Flotta Lauro brochure from my private collection. This brochure was issued in the mid sixties when she was still a two-class liner. In addition several images have been lifted from a later brochure that I have of the ship during her early cruising days. I trust that you will enjoy going down memory lane of this fine liner and cruiser ship that received a bright new modern interior. Flotta Lauro stated in this brochure that she was … “A masterpiece of modern interior design” and she certainly was, and I mean, both her interiors and her sleek exterior! 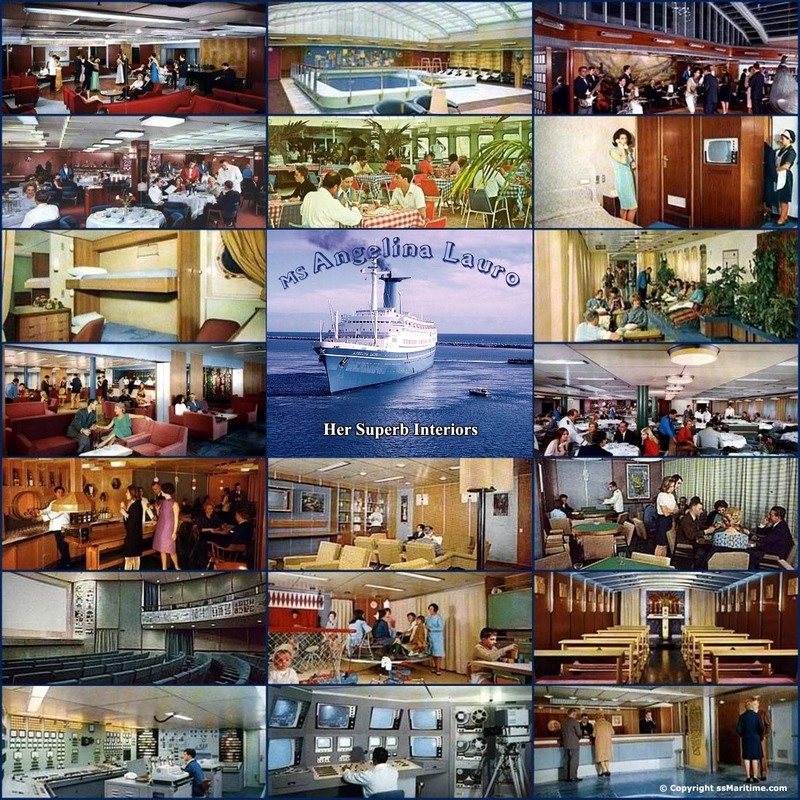 The following photographs are from a Flotta Lauro brochure of the cruise ship Angelina Lauro. Although she retained her original funnel markings, she was marketed by Costa Lines who later chartered her outright and gave her the traditional Costa funnel, yellow with a large blue C for Costa. Page One: The Oranje Story From shipyard, Wartime until her sale to Italy in 1964. Page Two: The Angelina Lauro Story Transformation into an modern Italian liner. Page Four: Angelina Lauro’s demise A Tragic Day on March 30, 1979.
. passenger Dieuwertje Goedkoop. Note: This is the ONLY Passenger List Have! Visit our Main Index for features on other Dutch liners, such as the MS Johan van Oldenbarnevelt, Sibajak, Willem Ruys (Achille Lauro), the TSS Rijndam and her sister the TSS Maasdam, as well as the then Flagship of Holland America Line, the grand SS Rotterdam and the magnificent SS Nieuw Amsterdam, as well as the three simple migrant ships; the SS Waterman, Groote Beer and Zuiderkruis, as well as the famous small, but the “Elegant White Yachts” of Royal Interocean Lines as well as a number of other excellent Dutch Passenger/Cargo ships. All of these can be found on my ssMaritime Main Index below.